I've been here in Japan for half my life. 26 years (please don't do the math!). I came here when George Bush, Sr, was US president. I was here for the first Gulf War, saw "the skies lit up over Baghdad." Here for the Clinton economic boom, the dot-com boom. Bush, Jr's presidency, 9-11, two more wars. The home-lending meltdown, economic recession. The Obama administration, slow economic growth. The biggest thing that comes to mind over these 26 years is change: personal, technical and political. I met my wife at the end of my first month here, we started dating 6 months later, and have now been married for 23 years. We have four great kids of whom we are very proud. Our eldest works for an airline, the 2nd is in med school, the 3rd in college now, and the youngest in high school. I have a job I enjoy, and have started to grow some vegetables in summer. When I came to Japan in 1990, you had to pay $600 to buy a phone line, which could be sold to others when you left. I chose not to do so; instead, I bought magnetic cards you could use in int'l pay phones to call the States at over $1/minute. I made one phone call per month. One. Nobody had a PC, banks did everything on paper. Even a deposit needed to be checked by 4 different people, and took close to 10 minutes on a good day. Was handed my monthly salary in cash (and nearly had a heart attack, having literally never seen that much cash at once. Paid by check in the US, paid my own bills by check). Bought my first computer on a trip home in late '94, because PCs here were hard to find and twice as expensive. In late 2000, when then-Prime Minister Mori set a goal of high-speed internet access for over 3 million households within 5 years, I laughed (I had 56K dialup that disconnected every time I got a call). But they did it, and then some. 1G home access is standard now, at some of the lowest rates in the world. PCs, while still slightly more expensive than comparable units in the States, are much more affordable. Smartphones are de rigueur. Thanks to Line™ and Skype™, I can now speak to family Stateside for free. I just signed some contracts electronically, instead of having to snail mail, sign, get notarized, and return by snail mail, for a grand total of about 3 weeks. These changes are primarily positive. But there have been changes, politically, which I find quite disturbing. Not about your political party, but about discourse in general. I have no problem with people of different political bent; that is what democracy is about. But the increasing polarization of the political process, the refusal to even civilly discuss issues among those on opposite sides, let alone try to reach compromise solutions that, you know, compromise, is truly heart-rending. It has become "My Way or the Highway!" And if people lose an election, many of them, instead of looking to continue working toward their goals, act like a child having a tantrum and threaten to leave the US. Ah, political discourse in 2016. Wow. He really got me there. Just tore me a new one; proved me wrong; persuaded all, including me, of the error of my philosophy. Made me realize how we can make America great again; showed the moral superiority for which we are so famed. Held the moral high ground; showed the depths to which I have sunk. And this is my "friend". The candidates are even worse. "Coming of Age Day" celebrates all those who have become legal adults, turning 20 during the year running April through March. 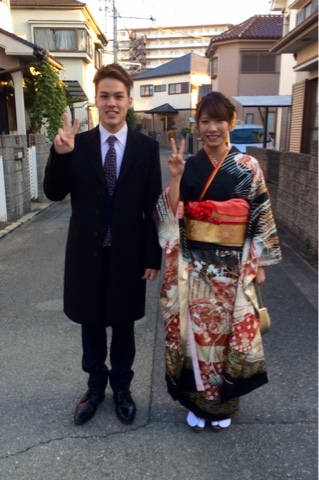 Young men wear suits or the traditional hakama (kimono tunic with baggy trousers). 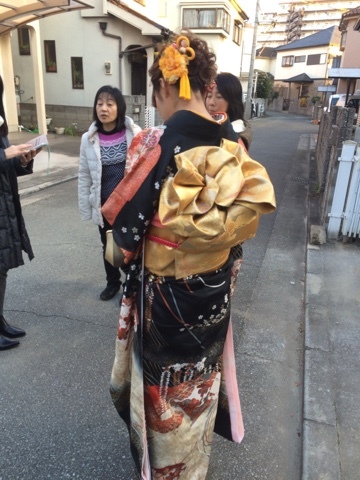 The women wear brightly flowered kimonos with obi (waist sash), and furred stoles on cold days. College students return home, workers have a holiday. Their city or town has a ceremony where they try not to sleep through numerous speeches about their rights and responsibilities as newly-fledged adults. Many who, like my son, went to private secondary and senior high schools, will see elementary school classmates they haven't seen in eight years. After the ceremony, many will visit their elementary school, opening time capsules or meeting teachers from long ago. Then they will meet groups of friends and go out, maybe singing karaoke, maybe tossing back a few. 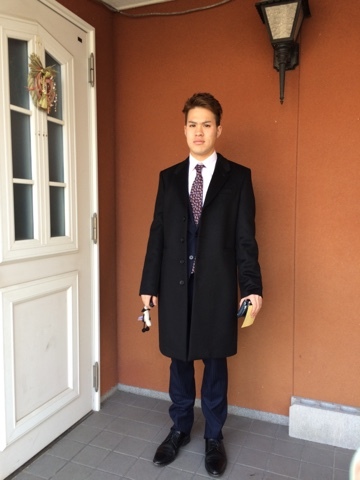 My son leaving for the Coming of Age ceremony. The obi sash from behind. You ever have an itch behind your eyes, a mental one, one that just drives you crazy. You know, like the nagging feeling you’ve left the gas on in the kitchen (Hah! Let’s see you NOT go check on that later!). 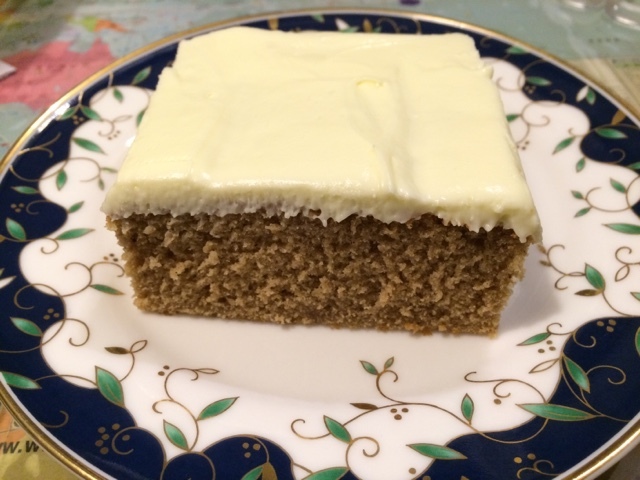 My kids freaked out: "I don't want to eat spicy cake!" "There's cinnamon in it." Ah, they're alive after all! Anyways, I broke out my Better Homes cookbook, and looked up the spice cake recipe. And then started modifying. 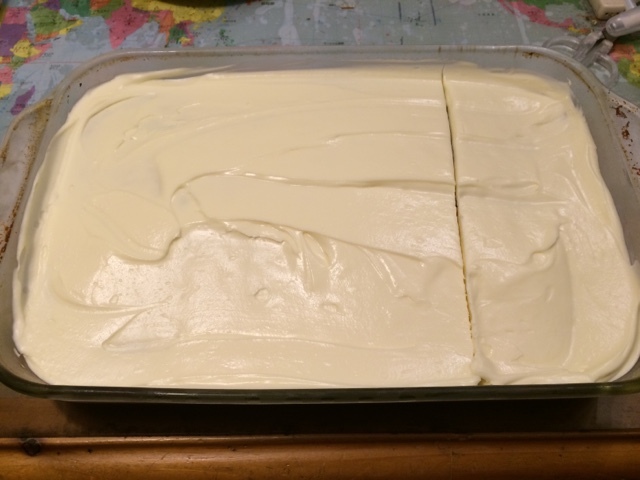 One small package of cream cheese, plus a half-pint carton of whipping cream. Start whipping them, then slowly dribble in a little powdered sugar. Keep dipping fingers to taste (preferably not the same one twice!) until it reaches your desired level of sweetness. I'll leave the rest up to the imagination. So, do you have a hankering? "We were working at the factory when we saw the smoke rising above Osaka. Huge clouds of it, the whole city was on fire. "The factory we had been pressed into working at was Army, so we had huge stockpiles of rice. We were immediately ordered to start cooking it for the people of Osaka, and made a line. One boy would scoop rice into the next boy's hands; he would mold it a little, then pass it to the next boy, who would do the same, as would the 4th. The last boy would take the finished rice balls, which were about softball sized, and put them in pallets for loading on large trucks. "My friend, S--, snuck one rice ball out, for we were very hungry. We five sat around looking at it for a long time; no one wanted to be the first to reach for it. After a long time, it was put back on the truck." This story, told to me this week by my older student, says so much about the Japanese character. They were young men, boys, really, who were barely surviving on severely reduced rations near the end of the war, yet they did not eat the rice ball, because it was for others who needed it even more. After the earthquake and tsunami of 2011, there was no looting. People waited in line calmly for their rations. People would go out to where their homes used to stand, and start digging through the rubble. Often their own home was completely gone, the rubble was stuff that had been deposited there by the retreating wave. These people would start digging through the rubble, and would make 2 piles: their possessions and other people's possessions. They did not keep things that didn't belong to them, no matter how useful they might have been. I had one of those surreal moments in class the other day. I have a new student, an 84-year-old man who wants to study English to keep his mind sharp. In the course of getting to know each other in the first lesson, the topic turned to hometowns. I asked him where he came from, and he gave me a list of towns he had lived in as a child. This guy really got around, I'm telling you! 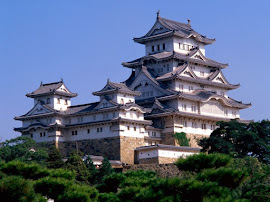 Then he said that he lived in Maizuru during the war. Hmm, OK, I guess. Then he paused, bowed, and apologized: "I'm sorry, Sensei, but I worked in a bomb factory." Brainfart. What do you say to that? "No problem, we bombed those factories to dust!" I'm not a war-apologist. I don't apologize for things done during WWII. Hell, my parents were barely in puberty when it started, and I didn't come around until 18 years after it ended. And while there may have been a few incidents, I support the decisions made and actions taken by the US. But I don't know how to react in these situations. I have had men thank me, on two different occasions, for the nuking of Hiroshima and Nagasaki, because it meant they wouldn't have to oppose a US invasion of the home islands. Another guy joked and told me how they were paid 1 yen when his grandma was killed in the bombings, and 3 yen for the house. Another man joked about sitting around his anti-aircraft battery and not even bothering to load the damn thing, because it couldn't even reach halfway to the B49s plastering Kobe. And every one of them apologized for their part in the war, even the trainee sailor who went out on a small patrol craft and was shocked by a brilliant flash a few hours later as his home port evaporated. Wow, I don't believe it. I finally got one! I finally got one of my very own. My very own Banana Republic! I've been watching CNN the last few days and shaking my head in disbelief. I am immensely disappointed by the games I see coming out of the fruitcakes on Capital Hill. I know people have strong opinions vis a vis ObamaCare. My friend, R, a Libertarian who makes Rand Paul seem middle of the road, is concerned about the financial issues of big government and the 'imminent' collapse of the dollar. Another friend, S, is wholly on board for ObamaCare, her life having been saved when she discovered cancer during a period when her family had to choose between insurance or food on the table. Still another friend, E, represents the conservative right, with concerns about family values and religion. A different R had his own small used-car lot, and had concerns about how he and other small-business owners would pay for their employees' insurance. I don't want to pay taxes. I don't want to have to pay the $1500 yearly auto safety check required here in Japan. But these are the law. Don't pay your taxes, you will be fined, possibly even imprisoned. Don't do the safety check, get your car towed. These are laws on the books, which I cannot simply choose to ignore. Yet that is what is happening today. Here we have a law which has gone through both houses, and then been signed into law by the President. A small group of Republican lawmakers don't like ObamaCare, and have decided to hold all government programs hostage. Today Boehner came out of the White House, saying that Obama won't negotiate on this issue. I have one question: Why should he? This is not a bill under negotiation. This is not a proposed amendment or any other writ which requires all parties to consider carefully whether or not to proceed. It's already a law. That doesn't mean concerned parties can't fight it. I have no objection to any group using any legal and ethical methods available to them to attempt change. Negotiate to pass amendments to the law, or even attempt to get the backing to repeal the law altogether. If I agree with you, I will stand with you. If I don't, I may stand opposite you. That is the beauty of the American system, the fact that anyone may strive toward a majority acceptance of their view which leads to real change. But what John Boehner and his relatively small group is doing is a travesty.